Boil two cups of water. Stir in oatmeal and remaining ingredients. Reduce to medium heat and cook for 5 minutes. Cook for less time if using instant oatmeal. I usually add Stonyfield Organic Low Fat French Vanilla Yogurt to Claire and Afton's oatmeal to cool it down and give it flavor. I eat mine with Skim Milk. 1. In a small saucepan, combine the milk, sugar, pumpkin, vanilla, and if using, and spice. Bring to a gentle boil and stir in the oatmeal. Reduce the heat and simmer for 2 to 3 minutes, until the oatmeal is soft and creamy. Stir in peanut butter, if using. 2. Spoon the oatmeal into bowls, sprinkle with dried fruit and nuts, if you like, and serve warm with maple syrup. 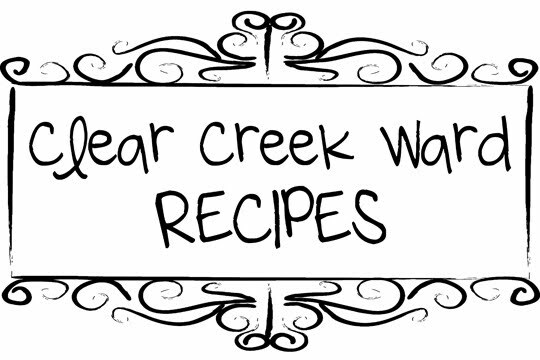 *I usually omit the last step and cook with water instead of milk 2 cups water to 1 cup oatmeal. I usually add Stonyfield Organic Low Fat French Vanilla Yogurt to Claire and Afton's oatmeal to cool it down and give it flavor. I eat mine with Skim Milk. Combine beans and milk; blend until smooth. Beat in rest of the ingredients and pour into pie shell. Bake at 350 degrees for 45 minutes. Cool. Enjoy. Great with whip topping. Combine all ingredients except milk and flour in a pot and bring to boil. Simmer for 45 minutes. Whisk flour into milk until there are no lumps. Whisk into stew. Return to boil while stirring, simmer 1 min. Serves 5. 2. A taste is just a taste - Let your child decide the amount to try. A taste can be as small as 1/2 teaspoon. 3. What goes in may come out, and that's okay! - Recent studies indicate young children are more likely to try a new food if they have the option of not swallowing it. Show children how to carefully spit food into a napkin if they decide they don't want to swallow it. 4. If at first you don't succeed, try again. - Many young children must be offered a food 8 to 10 times before they will try it, according to recent research. Continue to offer a new food... don't give up. Eventually they are likely to give it a try. 5. Be a role model. - Imitation is a powerful force in learning. If you want children to drink milk, for example, make sure they see you drinking milk as well. 6. Capitalize on "food tasting peers". - To encourage a reluctant taster, have him or her sit with friends or siblings that are good tasters when you introduce a new food. 7. Serve an unfamiliar food with familiar ones. - It increases the likelihood that a child will taste the new food. For example, use pudding as a dip for trying pineapple spears of kiwi slices. 8. Color and texture make a difference. - Children prefer bright colors and interesting textures. Crunchy fruits and smooth pudding make a nice contrast. The bright color of red and yellow bell peppers may entice them to taste. 9. Involve children in the preparation. - Children are more likely to try a food they have helped to prepare. Even young children can help stir, mash, pour and measure. 10. You can lead them to a new food, but you can't make them eat. - Never force a child to try a food. Offer it. If it is not eaten, simply take the food away and present it again at a different time. 5) Bread, Cereal, and pasta. All food groups are important for good health. 12. Lessons from literature. - Read stories about food to your children. They may be more likely to try a food that has been introduced in a story. · Have a Theme Dinner- Eat only foods that start with the letter “P” (pineapple, pizza, peanuts…) or focus dinner on colors, shapes, textures. · Use dips and Toothpicks- yogurt makes a great dip for fruit and a grape stuck on a toothpick dipped in yogurt equals FUN! · Do you want carrots or peas for lunch? · Do you want me to cut it, tear it, or leave it whole? · Do you want to dip it in ketchup, ranch, bbq sauce? Mix all together and bake at 350 degrees for 45 min in loaf pan or 15-20 min. in muffin tin. About 10 min. before done cover meatloaf with glaze. Then finish baking. When meatloaf is done, top with mashed potatoes (I use instant potatoes to use up food storage!). Spread potatoes on top to look smooth like frosting. Then sprinkle with bacon bits or chopped veggies to look like sprinkles. Cook bacon until crisp and crumble it. Reserve 2 Tblsp of the bacon drippings, and cook the onion in the fat until tender. Add potatoes, chicken broth, water, salt, and curry. Add peas if desired (amount is just an estimate). Cover and cook 10 mins or until potatoes are tender. Mash potatoes slightly with fork if desired. Stir in evap. milk, parsley, and crumbled bacon. Heat through. Serves about six. I brought these granola bars that Kristin originally posted to this blog. They have become a favorite at our house. We like using pretzels and chocolate chips. -In a shallow bowl combine first 5 ingredients. -Place 1/4 C. ranch dressing in another bowl. -Toss chicken in dressing, and then roll in cornflake mixture. -Place in a greased 11x7x2 inch baking pan. -Bake, uncovered, for 12-15 minutes or until juices run clear. -Can serve with additional dressing for dipping. Soften cream cheese and whip with 1 tablespoon mayo until light and fluffy. Set aside. Cut cucumber in half and remove seeds with a spoon. Dice and set aside. Chop Ham and set aside. Spread 2 tablespoons of cream cheese mixture on each tortilla, working one tortilla at a time. Sprinkle ham and cucumber. Add salt to taste. Roll tortilla tight into a pinwheel. I use a little cream cheese to seal shut. Slice into thirds. Prep: 15 minutes, Bake: 10 minutes. 2. Beat butter and sugars at medium speed with an electric mixer until creamy. Add eggs and vanilla, beating well. 3. Lightly spoon flour into dry measuring cups, and level with a knife. Combine flour, baking soda, and salt in a bowl, stirring well. Add oats; stir well. Add to butter mixture; stir until well blended. Gently stir in chocolate chips, macadamia nuts and coconut. Drop by rounded tablespoons 2 inches apart onto baking sheets lined with parchment paper. Bake at 350° for 10 minutes or until brown around edges. Cool on pan 2 to 3 minutes or until firm. 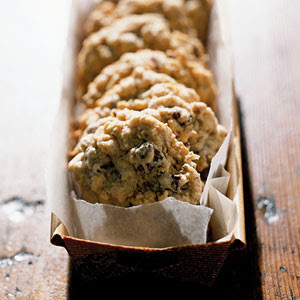 Remove cookies from pan; cool on wire racks. **I baked these at 335 degrees for 10-12 minutes or longer and instead of parchment I used my silpat. This was the first time I tried this recipe but I did add an extra 1/2 cup of flour. Also, the original recipe uses pecans and big semi-sweet chocolate chunks-no coconut which I'm sure would be good. I'm a bit sloppy with the vanilla and always add extra.